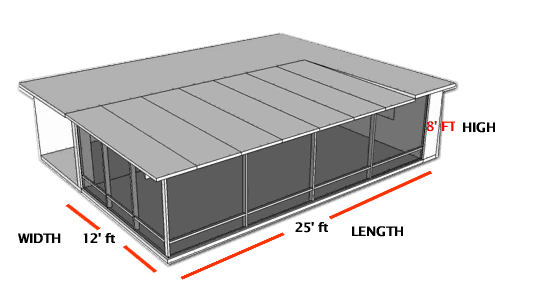 At Alumicenter, the pricing for a standard screen room enclosure can range from $7 to $8 per square foot for the screen walls and $13 to $16 for the roof, depending on the type of insulated panel (3″, 4″ or 6″). Engineering drawings, load calculation, and other pertinent data are all part of the total package provided to the local building department, and all our jobs are designed, manufactured and installed according to plan. Some items are upgrades and are not considered standard for a screen room enclosures: special size doors, skylights, ceiling fans, privacy screening, kick plates, solar screening, and Nylo Tec hardware. Also perimeter Footing may be required and would be added on the final price.